Dalton Mayer, Miami Trace shortstop, hit a grand slam home run Monday, April 15, 2019 in the Panthers’ 7-1 win over Chillicothe. 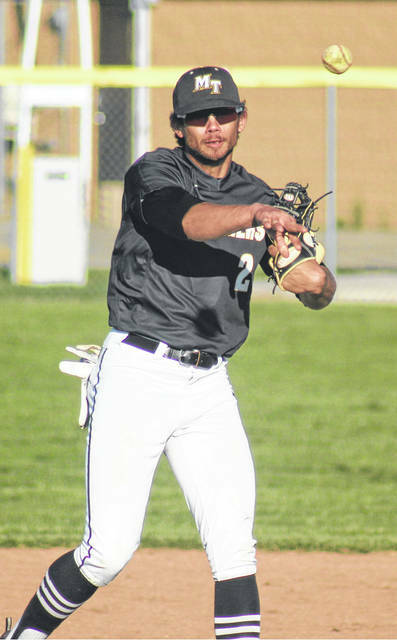 The Miami Trace Panthers varsity baseball team won its second Frontier Athletic Conference game in a row Monday, defeating Chillicothe, 7-1 at Miami Trace High School. The Panthers got a complete game pitching performance from Austin Brown who allowed one unearned run on seven hits with one walk and eight strikeouts. Brown is now 2-2 on the year. Riffe started and took the loss for the Cavaliers. He pitched six innings with 10 hits and seven runs. He walked two and struck out two. The Panthers hit their first two home runs of the season Monday. Dalton Mayer hit a grand slam home run in the fourth inning and Drew Batson, going 4 for 4, hit a home run in the first inning. Batson also hit a double. Miami Trace led 1-0 after the first inning of play. After a scoreless second inning, the Cavaliers tied the game in the top of the third. Miami Trace took the lead for good with Mayer’s grand slam in the bottom of the third. The Panthers added two more runs in the bottom of the sixth. Connor Bucher went 2 for 4 with two runs scored. Josh Gilmore, Cody Brightman and Luke Henry also had hits for the Panthers. Gilmore scored one run, Henry scored one and Batson scored twice. “Our bats woke up a little bit today,” Miami Trace head coach Rob Smith said. “Some balls starting finding some holes. “This was a really good win tonight,” Smith said. “Chillicothe just shut out Jackson on Friday and all their other league losses have been by one run. So that was a very good baseball team. “We still missed opportunities to score more runs,” Smith said. “We scored as many runs tonight as we did in the first round of the league. That was a pleasant sight. “We still have to clean up some stuff,” Smith said. “We made mistakes, but, when you get a good pitching performance like Brownie gave us tonight, sometimes that can mask some of our defensive mistakes. “Drew Batson came alive at the plate tonight,” Smith said. “He batted over .500 last year. It was great to see that tonight. “That grand slam by Dalton Mayer will give him some confidence, as well. Miami Trace (7-4 overall, 3-3 FAC) is off Tuesday and at Mitchell Park in Greenfield to take on McClain Wednesday at 5 p.m. The Panthers play Meigs at the VA Stadium in Chillicothe Thursday at 5 p.m.
Offensively for Miami Trace: Connor Bucher, 2-4, 2 runs, 1 rbi; Drew Batson, 4-4, 1 home run (1), 2b, 2 runs, 2 rbi; Cody Brightman, 1-4; Josh Gilmore, 1-2, 1 run, 1 bb; Dalton Mayer, 1-3, grand slam (1), 4 rbi, 1 run; Austin Mathews, 0-3; Austin Brown, 0-2; Mason Snow, 0-1; Luke Henry, 1-2, 1 run, 1 bb; Tyler Eggleton, 0-2, sac; Braden Cooper-Smith, 0-0.